Josh Donaldson is the newest member of the Cleveland Indians and has joined his team but it does not mean the third baseman is ready to play. Donaldson is not expected to play Sunday afternoon as Cleveland hosts the Tampa Bay Rays in the final contest of a three-game series. Donaldson, who was acquired Friday night in a trade with Toronto, is in uniform, but is not expected to play immediately. Donaldson hasn't played in a major league game since May 28 because of a strained calf. Once Donaldson is ready to play, manager Terry Francona said Donaldson will be the Indians new third baseman. Jose Ramirez will move from third base to second base, and second baseman Jason Kipnis will move to center field, where he will compete for playing time with Greg Allen. For now, Ramirez remains at third and Kipnis at second. Ramirez has emerged as a strong candidate in the MVP race. Only one player in American League history, Ty Cobb in 1909, has led the league in home runs and stolen bases in the same year, and Ramirez has a chance to do it in 2018. Ramirez is second in the league in stolen bases with 29, one behind Seattle's Dee Gordon, and is third in the AL in home runs with 37, two behind co-leaders Boston's J.D. Martinez and Oakland's Khris Davis. "He's grown into his power without sacrificing speed. You don't see that very often," Francona said of Ramirez. "All the big things he does, he does the little things, too." The Indians' starter Sunday will be right-hander Carlos Carrasco (16-7, 3.38), who ranks in the top 10 in the American League in ERA, fewest walks per nine innings (1.8), strikeouts and strikeouts per nine innings (10.4). 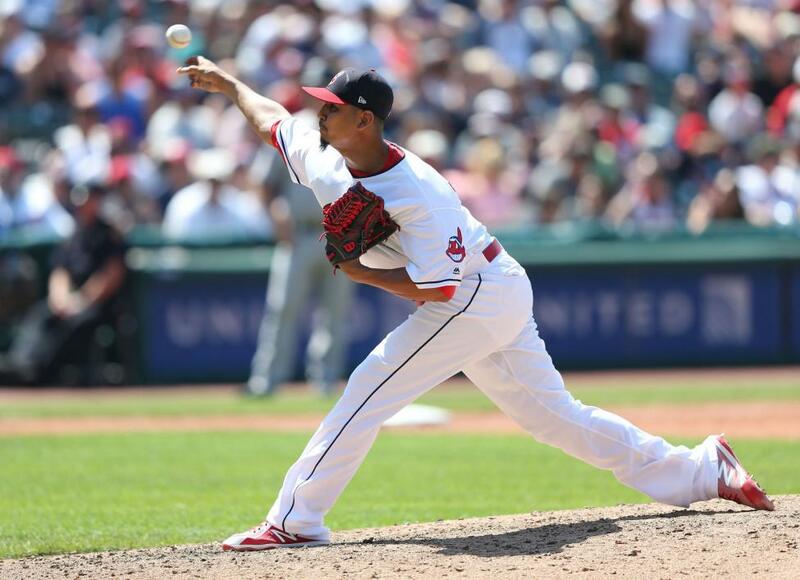 In his last start, Carrasco was the winning pitcher in an 8-1 Cleveland victory over Minnesota. In that game Carrasco pitched 7 2/3 scoreless innings on four hits, with 11 strikeouts and two walks. In his last 11 starts Carrasco is 8-2 with a 2.13 ERA. Sunday will be Carrasco's first start against Tampa Bay since Aug. 11, 2017, when he was the winning pitcher in a 5-0 victory. Carrasco pitched eight scoreless innings in that game, allowing two hits, with 10 strikeouts and two walks. In nine career appearances against the Rays Carrasco is 4-3 with a 2.77 ERA. With the expanded September rosters, the Indians Saturday activated outfielder Rajai Davis from the 10-day disabled list. Cleveland also recalled catcher Eric Haase from Triple-A Columbus and selected the contract of right-handed pitcher Jon Edwards from Columbus. On Sunday, the Indians are expected to activate reliever Neil Ramirez off the disabled list. Tampa Bay has activated left-hander Vidal Nuno from the disabled list and recalled right-hander Jaime Schultz from Triple-A Durham. Rays center fielder Kevin Kiermaier was removed from Saturday's game in the seventh inning because of back spasms, but is expected to play Sunday. Tampa Bay's Sunday starter will be reliever Diego Castillo (3-2, 3.73). Castillo has appeared in 33 games this year, 30 in relief and three as a starter. As a reliever he is 3-2 with a 3.53 ERA. In his three starts he has a 5.06 ERA and no decisions. In those starts he has pitched a total of 5 1/3 innings, allowing three runs and six hits, with six strikeouts and no walks. Castillo's last start came Aug. 29, an 8-5 Rays win over Atlanta in which he pitched two innings, giving up three runs and three hits, with two strikeouts and no walks. Sunday will be Castillo's first appearance against Cleveland.